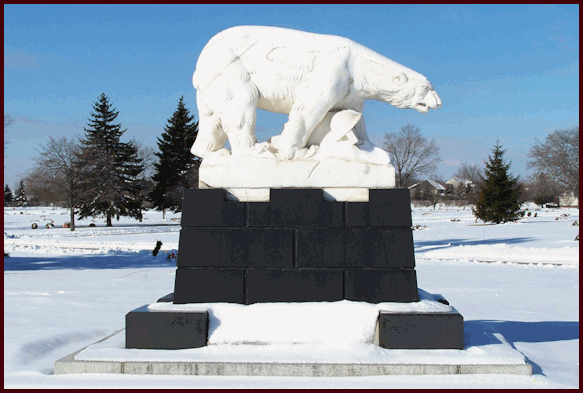 The Polar Bear Monument at White Chapel Cemetery in Troy, Michigan is the work of sculptor Leon Hermant and was dedicated on May 30, 1930. White Chapel's mission includes Honoring Veterans. Thus a special service is held on Memorial Day to honor the Polar Bears (see photo at left). These men, officially designated the American North Russian Expeditionary Force and also known as "Detroit's Own" and "Polar Bears", were sent by President Wilson to North Russia where they fought the Bolshevik Red Army from September 1918 through June 1919. 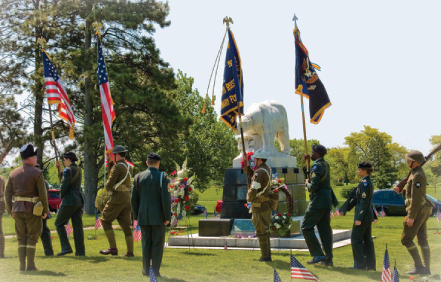 Polar Bear Memorial Association members and the public are invited to attend the next Memorial Day Service honoring the "Polar Bears", on May 25, 2009 at 11:00 AM at the monument in White Chapel Cemetery. For details, and for more information on the monument, visit the association's Polar Bear Monument web page.